SnugTop Truck Caps has a full selection of fiberglass truck caps for work & fun. SnugTop Truck Caps started out as an auto supply retail store in 1959 and by 1965 was manufacturing fiberglass truck caps for the original Datsun mini-truck. The company quickly followed that success with truck caps for the Chevy El Camino and Ford Ranchero. 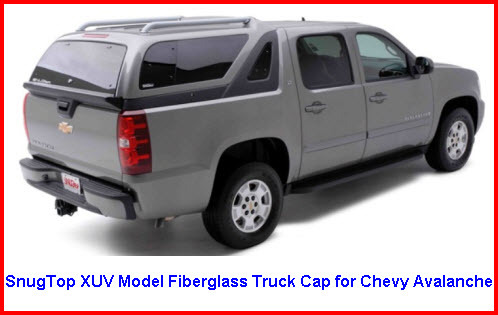 Today SnugTop Truck Caps makes both fiberglass and aluminum truck caps for Chevy/GMC, Dodge, Ford, Mazda, Mitsubishi, Nissan, Subaru & Toyota models marketed and sold in the USA. But SnugTop also manufactures and sells a line of truck caps designed for markets outside the USA. In particular, SnugTop supports the Ssang Yong Actyon, the Toyota HiLux, the Mitsubishi L200, the Nissan Navara and the Isuzu D-Max models with unique and stylish looking fiberglass truck caps. So almost no matter where you buy a pickup in the world, you can count on being able to get a SnugTop Truck Cap for it. SnugTop Truck Caps also lives in the real world of the working person who needs a utility truck cap to support their labors. 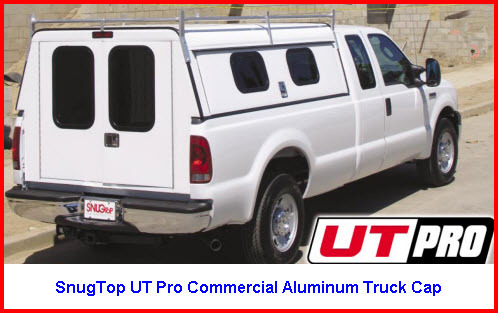 The company makes a line of heavy duty and stylish looking commercial aluminum truck caps and a fiberglass commercial truck cap that is hard to distinguish from its shiny, sleek recreational truck cap counterparts. If you live in the real world you need to take a look below at what SnugTop Truck Caps may have for you and your pickup. This is SnagTops classic truck cover model. Easy to install & remove. Gently curving lines make it easy on the eyes. The new sleek, but economical model from SnugTop. Comes with a curved glass rear door, rotary latches and pop out lock. An extra large rear window and graceful lines makes this SnugTop Truck Cap look like it came with your pickup from the factory. Made just for the Chevy Avalanche to give it an SUV type look and some enhanced functionality. Low profile, contoured design to match the Hummer H3T styling. It protects your cargo from weather and theft. It kinda reminds you of the old HumVee. Ya, SnugTop Truck Caps makes fiberglass truck caps for pickups you don't even see in the good old USA. These international truck cap models from SnugTop have the same great stylish looks, similar feature set and are made by SnugTop. Here's a quick list of the pickups and the topper that SnugTop makes for them.